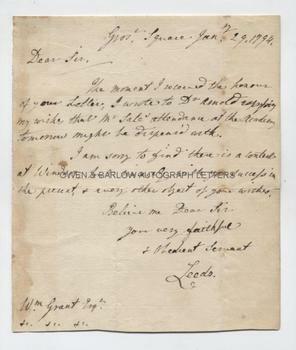 FRANCIS OSBORNE, DUKE OF LEEDS Autograph Letter Signed. British (English) statesman. Pitt the Younger's Foreign Secretary. ALS. 1p. Grosvenor Square. January 29th 1794. To William Grant. "The moment I received the honour of your letter, I wrote to Dr. Arnold expressing my wishes that Mr Sale's attendance at the Academy tomorrow might be dispensed with. I am sorry to find there is a contest at Windsor, but sincerely wish you success in the present, and every other object of your wishes." 4to. Approx 8.5 x 7.25 inches. Slight age toning and browning to left edge. Slight mounting traces to top corners of blank verso. Very good. Francis Godolphin Osborne, 5th Duke of Leeds was William Pitt's Foreign Secretary, having previously turned down the offer of becoming Britain's ambassador to France. He remained as Foreign Secretary from 1783 to 1791. His tenure was not marked by any great success and, in particular, he did nothing to establish good relations between Britain and its former colony, the newly independent United States. Both John Adams and Thomas Jefferson considered him to be obstructive and claimed that the Duke of Leeds had an "aversion to having anything to do with us". From 1789 to 1790 the Duke of Leeds was Leader of the House of Lords but in 1792 his offer to head the new coalition government was rejected by both William Pitt and George III. Sir William Grant (1752-1832) English politician, lawyer and Master of the Rolls. Grant had lost his seat at Shaftesbury following his judicial appointment but won it back in 1794 following what was reported as a strenuous and hard-fought campaign at Windsor. In March the same year (two months after the date of this letter) Grant was appointed as Solicitor-General to Queen Charlotte. He became Solicitor-General in 1799 and, subsequently, Master of the Rolls. Dr [Samuel] Arnold (1739-1802) was a noted musician and composer. The "Academy" referred to is the Academy of Ancient Music, of which Arnold had been appointed Director in 1789.